Adam appears in the door. “In my room. But, mom, I laid it down so the zips were all underneath and the frame was on top! The babies would have had to turn it over!! I take his point. In that backpack, we have a calculus text (approx. 12 pounds), a chemistry text (10), biology (8), and English literature (8), plus assorted binders and educational paraphenalia. Shifting that thing when you weigh no more than 20 pounds yourself, would be no mean feat. We check the front hall. Against all probability, the backpack lies belly-up. Having already learned the futility of trying to weasel information out of Nigel, I simply do the maternal and use this incident to remind Adam why his backpack is to proceed directly to his room after school. Adam, however, is curious, and decides (naively) to get to the bottom of this. “HELLO, IS THAT MARY P?” Ouch. Lordy, this woman is loud. “Yes, it is.” I move the phone a couple inches away from my stricken ear. “Ah, yes.” I pull the phone another couple inches out. A loud mother is pretty likely to have a loud child. Another couple inches. And can I really deal with this volume for the next three years? My ears are still ringing. My arm is almost straight out. No, I can not. Not everything about her is bad and wrong. Some of her traits – modesty, kindness – are wonderful. But the whole package as a way of life? She’s so limited! I see a similar duality between the images of motherhood. Many (most?) North American mothers seem to be striving to be good mommies. But you know what? Good Mommies are to motherhood what Ladies are to womanhood. Let’s take a look at the Good Mommy, shall we? The Good Mommy is kind and nurturing. The Good Mommy loves her children. The Good Mommy knows that her children have their little quirks – who doesn’t? – but they are at heart truly kind, sweet, loving, patient, smart little people. They are never rude, or selfish, they are only tired or hungry. They are never aggressive, they are only frustrated. They are never disrespectful, they are only confused. They are never enraged, only sad. Poor little mites! You see, Good Mommy is doing herself no favours. Perhaps more importantly, certainly more important from her perspective, she is doing her children no favours. Is it any surprise that, rather than having long since faded away now that the child is closing in on Junior Kindergarten, the tantrums are ongoing and getting worse? This child is learning that the tantrums are not her fault. The child is learning that mom is incapable of helping her control the rage – because she’s not angry, she’s only sad! We need to ditch the Good Mommy, and proceed with a new mother image. How about the Strong Mommy? The Strong Mommy is nurturing, but she also has a solid self-respect. Strong Mommy knows that her children, like every single member of the human race, are capable of kindness, tolerance, compassion, patience, and great good. They are also equally capable of unkindness, intolerance, selfishness, impatience, and great ill. Because they are human. Children are human. They are not paragons. They are innocent, yes, but we all know innocence can be dangerous. Small children have to be watched very carefully around small pets – a four year old can, in total innocence, kill a hamster. Yes, she’d feel very badly after the fact – but the hamster probably feels worse… Innocence doesn’t prevent one from being selfish. In fact, I’d argue that it makes it more likely. Strong Mommies can look at their petulant, sulking child and see it not as sadness to be forgiven and excused, but a normal expression of childish inflexibility and selfishness. If every negative behaviour is only ever explained away and excused, when and how will the child learn to control and overcome these tendencies? Strong Mommies, who see the traits with clear eyes are in a far better position to teach the child another, better way of responding. And you know what? Your child will respect you, and be more secure because of it. So, let’s ditch the Good Mommy, shall we, and embrace the Strong one itching to get out of those ladylike confines. Our children will be better off. The house is tidy again, the floors clear, the table wiped down. The sun shines in through de-finger-printed windows, and the only sound in the room is the soft ticking of the clock, the ticketa-tack of the computer keys, and a low, gentle snore. Yes. There is a child sleeping on the other couch. She shouldn’t be here. She was supposed to have been picked up between noon and twelve-thirty. They have a special outing planned. She was to be picked up right after lunch, so she could sleep in the car on the way to their outing. Her nap generally starts at 1:00. I also always have them dressed in their outside gear if I know when the parent’s expected. Simpler for everyone. So don’t even ask. Noon to twelve-thirty, I was told. But I know this mother. I put baby in a fresh diaper at 1:00. I put her in her outdoor gear at 1:15. At 1:30, baby climbed up on the couch. And went directly to sleep. I did not stop her. Mom wants baby to sleep in the car, she should arrive when she says she will. She’s a lovely woman, smart, warm friendly, and completely in love with her child. I really like her. But she’s a terrible, terrible time manager. She always runs behind schedule. She’s reliably unreliable, so mostly I can work around the tardiness. Worse than the chronic lateness, though, is the poor communication. If you’re going to be late, you give a call. This has happened before, and there’s usually a long list of reasons why a call was impossible. I remain unconvinced. Anyone with a cell phone in a city can make a call at just about any time. Attention (hi!) Span? There’s (SMASH) nothing (hi!) wrong with (hi!) my attention (DATS MINE!) span. “Hi!” Timmy’s bright eyes twinkle up at me. He’s the smilingest, sunniest, brightest little guy. Cute as a button, too. Reminds me a lot of the youngest Disney dwarf, Dopey. Particularly the grin and the ears. Malli wanders by, humming a tuneless little ditty, a small blue plastic basket overflowing with big plastic blocks in her arms. “Why?” He looks at his foot, lifts it off the block and onto the floor. CRASH! The oversized blocks pour from Malli’s basket and bounce across the floor. She grins, then squats down to put the blocks back into the basket. Malli walks by with her refilled basket, humming that tuneless hum. CRASH! Malli has emptied the basket again in a different corner of the room. Her brown eyes are dubious, but calm. I’m looking for your input. What do you think? Does the state of a child’s room have any bearing on how they sleep? Let’s take a poll! Answer, if you will, these two questions about your child (or for each of your children). 1. Is your child’s room neat or sloppy? 2. How does he/she sleep? Emma and I are taking an ASL course. Emma found a Basic Signs book around the house, and – how’s this for random? – her friend Lina had the same book lying around her house, as well! The girls started memorizing their way through the books, but it didn’t take them long to realize that you can’t learn to speak a language by memorizing a dictionary. We can now spell our names. Heck, we can spell anything! But spelling… Well, no one wants to do that as a regular thing. I’ve done it, you’ve done it. It’s good for emergencies, but efficient? Not so much. Emma and I have sufficient signed words that we can communicate the basics. We’d not starve, and we’d always be able to find the toilet. But it’s very, very basic. I figure we’re at the level of the average, oh, 19-month-old. My sweetie is home sick. Not really, really ghastly ill, just weak and tired. Anna, however, doesn’t see a sick man, she sees a warm lap. He’s in a bit of a zone, and doesn’t register. Anna picks a board book from the floor. Yes, he is indeed a bit spacey today. Fatigue has fuddled his brain, made him a bit slow on the uptake. Anna gives him a sharp whap in the knee with the book. That should help him focus! “You sure are hard to resist, pumpkin. Here you go.” They snuggle in for yet another read of “Max and Ruby and the Rainy Day”. Gee. How long do you think it’ll be before I’m doing so well in my second language? * I just googled “speech development toddlers telegraphing” to find a good link to define “telegraphing” – and the first hit was my very own blog. Heh. Here we have a sweet, quiet, apparently solemn little boy. Any guesses as to what he’s doing? 1. No, he’s not been sent to stand in the corner. This is not a punishment. 2. In fact, it’s entirely voluntary, and, appearances to the contrary, he’s quite happy. 3. He can continue this activity for up to an hour, occasionally a little more. The boy is dancing. He requests music – specifically The Beatles – then stands immediately in front of a speaker, a solemn look on his face as he sways from side to side, staring into space. He will do this for the entire length of the disk – so, an hour, hour and a quarter. It’s really quite amazing. Our first significant winter storm hit last night. We got some snow overnight. 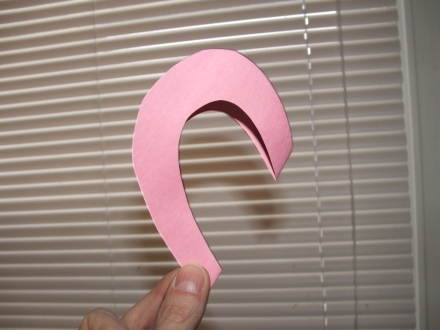 Not a whole lot – about 10 cm, I think. (Just shy of four inches.) Enough to snarl and slow traffic, but not enough to close roads or schools. — and my LORD, the wind. Straight out of the west. (North and west, or any combination thereof, are nasty, nasty winds.) By the time I’d hacked a narrow path through the bank, my fingertips were burning with cold and my face bright red. And not through exertion. Guess we’ll be staying in. Again. For the tenth straight day. That’s TWO SOLID WEEKS of being indoors. Housebound. With a two-year-old (sometimes two of them) and three 18-month-olds. Sigh. In fact, the kids are managing just fine. The vast vistas of my small house suffice for their short legs. After pounding through the living room to the dining room, rounding the corner to the front hall so as to enter the living room and pound down to the dining room… After doing that, oh THREE HUNDRED TIMES in a morning, they’ve had lots and lots and lots of exercise. But me? I have to get out. I think I’ll get Emma to mind the fort during afternoon naps, so I can get out, burn off some steam, get some fresh air and a little sunlight (assuming some happens). Yes, indeed. I’m going to SHOVEL THE DRIVE!! You takes your entertainment where you finds it in this job. * That’d be -8F, 31 mph, and -31F respectively. 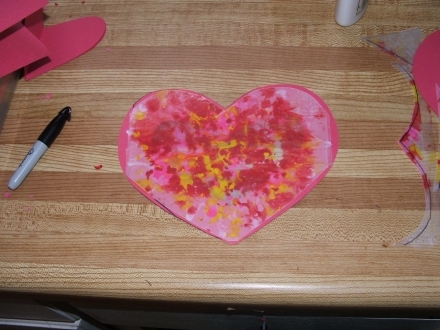 The tots have made a bunch of Valentine crafts over the past week. I’ve sent home pink blobs of paint (fingerpaint on heart-shaped waxed paper), pink blobs of paper on pipecleaners (supposedly flowers), pink blobs of sparkles (because a craft isn’t a craft if there aren’t sparkles to eat!!) The kids have enjoyed themselves greatly, and the parents have graciously ooh-ed and ah-ed over their pink blobs. Today is Valentine’s Day, though, and those gracious parents deserve something a little more festive and a little less amoebic. 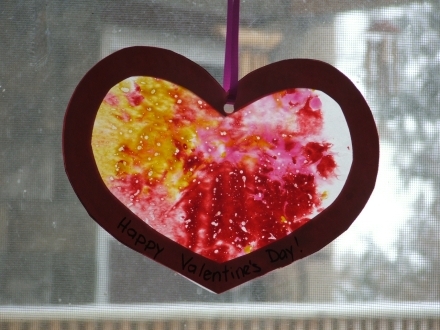 So – Valentine sun-catchers! Take a piece of wax paper. Ours were about six inches wide and the length of the roll. Place it on top of a section of newspaper on your kitchen counter. Fold the wax paper in half. 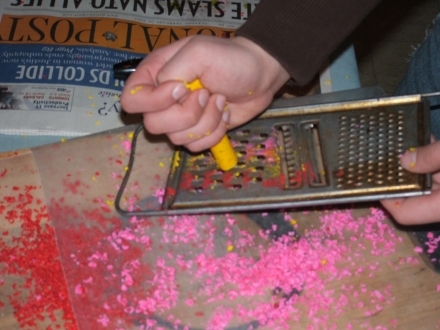 Sprinkle a little grated crayon onto half the wax paper. Don’t be too liberal in your sprinkling: too much crayon, and the light won’t shine through. Gently press with an iron set on delicate. If you simply press, the wax will melt in place. 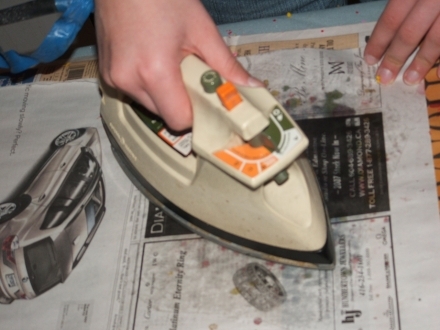 If you slide the iron around, the wax will swirl a bit. Totally up to you. 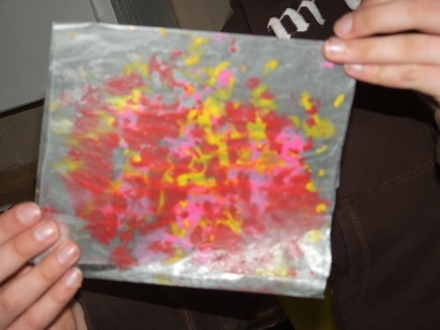 Open the frames, and place one onto the wax paper-crayon-blob. Trace around the outside edge. Cut the wax paper just inside the traced heart so you get a heart that fits the frame. Glue frames to the heart, one on each side. Punch a hole through the heart, string with festive ribbon, and hang in a window! Ta-dah! !